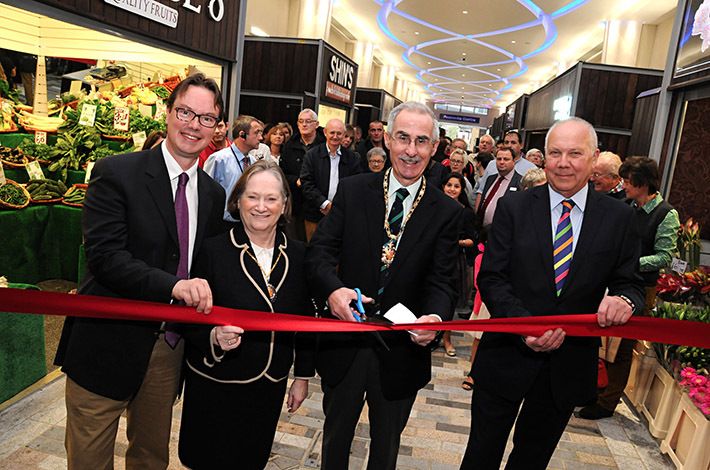 Market Walk, Woking’s new covered Market was opened on 4th October at a ribbon-cutting ceremony led by the Mayor Tony Branagan accompanied by his wife. Also present were (on the left) local MP Jonathan Lord, together with Councillor Gary Elson. 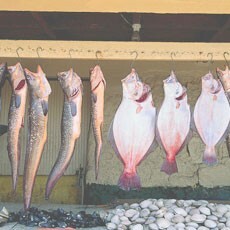 15 fully-equipped lock-up kiosks which offer food, catering and specialist offers. 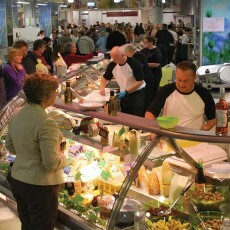 The new Covered Market replaces the Open Market on Victoria Way due to be closed for redevelopment in the New Year and has been created from the cavernous walkway which formerly separated the Wolsey Place and Peacocks Shopping Centres. A new mezzanine floor has been built to create backup storage and provide space for preparation areas and coldrooms. The walkway is now lined lined with 15 fully-equipped lock-up kiosks which offer food, catering and specialist offers – with a funky new ‘Mood ceiling’ with constantly changing LED lights. 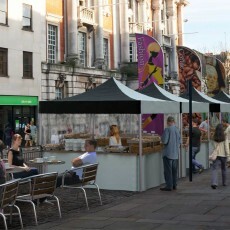 Market Walk also offers gazebo stalls for Casual stallholders and trades 7-days per week. Traders on the old Open Market have been promised they can remain trading through the Christmas period and Woking’s popular monthly Farmers Market continues to stand on Jubilee Square, at the end of Market Walk. 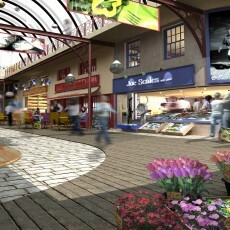 The new Market is a key element of ambitious plans to revitalise the Town Centre. The Market was designed by Quarterbridge working in conjunction with Benoy Architects. Quarterbridge have also provided the staff and set up a new management company to operate the Market on behalf of Woking Council. Jonathan Owen of Quarterbridge said: ‘Demand for kiosks and stalls has been excellent and we’ve opened fully-let. This new Market enables independent businesses to trade in a prime location at modest cost and shows how Markets still deliver the variety and footfall lost from so many Town Centres. Mary Portas – please note’. 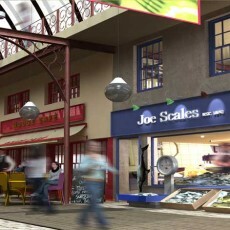 The new Market includes two Catering units, a Butcher, Baker, Fishmonger and Florist. Quarterbridge lettings department can be reached on 01206 761000.